Come on lovely early morning walk, to help identify and monitor the spring birds to be seen and heard in Ludwell Valley Park. 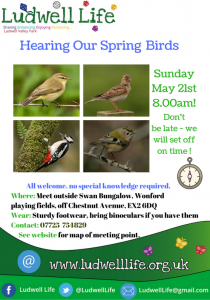 No special knowledge needed – there will be people there who can identify the birds. Just bring yourself, walking shoes and binoculars if you have them. The start time is 8.00am and we will leave on time, so don’t be late!